range from a few fF up to a several hundred of nF and the versatile possibilities to configure the chip to achieve a high measurement rate up to 500,000 Hz or a low current consumption of only a few µA. 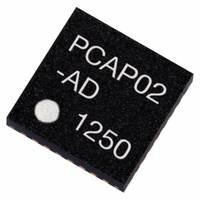 The PCap02 can be configured for highest sampling rates up to 500 kHz, lowest current consumption down to 2 uA or lowest noise of 15 aF (rms). 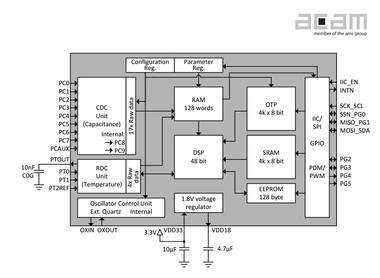 The internal signal processor allows for power efficient and fast calculations, e.g. for sensor linearization or complex arithmetrics.